As the clock strikes midnight on the night of December 31, the world lightens up to a loud cheer. A New Year symbolizes the start of a better tomorrow and a new beginning. It’s been only a few days since we opened doors to a New Year. And, like every year, we saw a lot of people around the world send out wishes, take up new resolutions or commence new journeys. New Years are all about letting go off all the old things and starting a fresh new adventure. And who better than the people we look up to help kick-start this awesome new year? 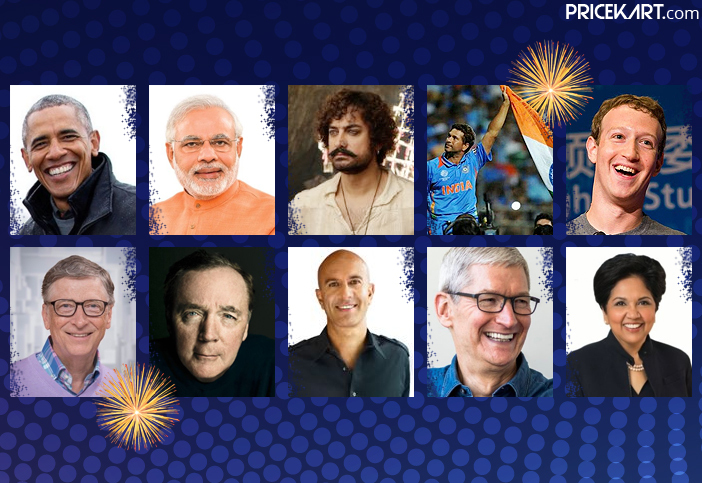 A lot of famous people around the world sent out New Year 2019 wishes to their fans and admirers across the globe. These wishes send out good luck, happiness and motivation for the year. 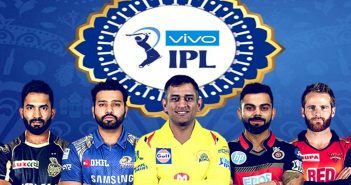 Let’s take a look at the various New Year 2019 wishes by some of the famous people around the world. If we are talking about famous people, then our Honourable Prime Minister, Narendra Modi has to top the list. PMO Modi is known for his unique persona and his dedicated work towards the country. On the eve of New Year, Prime Minister extended his greetings to the nation through his Twitter account. In his tweet, he wished everyone a joyous 2019 and a healthy New Year 2019. PMO Modi is an avid Twitter user and often takes to the social media platform to send out wishes and keep us updated with the current ongoings of being a Prime Minister. The former US President also sent out a New Years wish to all his followers through his Twitter account. He is known for his amazing work and dedication. Former President Obama has continued his work as a socialist to see the world a better place. His New Year 2019 wishes is no less than motivation for everyone who looks up to him to continue doing good work this year. As seen in his New Year post, President Obama spoke about doing a lot of great work together. Before stepping into 2019, he also took to Twitter to talk about some of the young activities and leaders who are changing the world in different ways and inspire the former US leader. 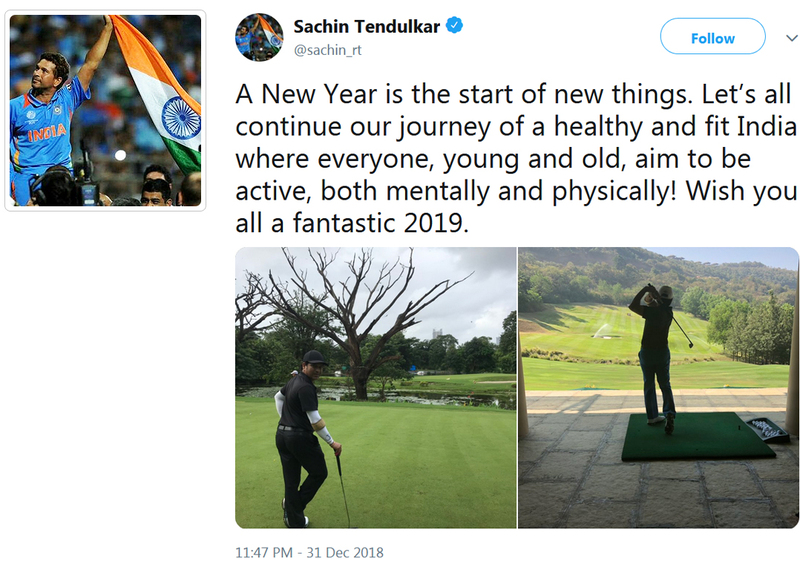 Bollywood’s Mr Perfectionist also took to Twitter to send his fans New Year 2019 wishes. Along with wishes, he also mentioned his resolutions for 2019. Aamir is a down-to-earth and a humble person, and his New Year resolutions prove these characteristics. Each one of us can connect to Aamir as we also set goals like getting in shape and spending more time with family every year. 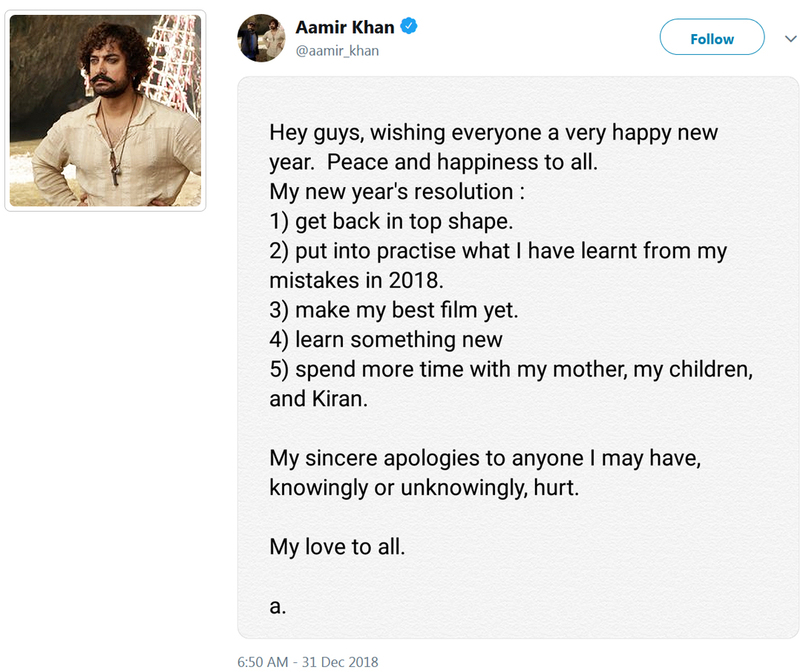 Aamir’s New Year tweet sends out a lot of peace and happiness. The actor is popularly also seen on television as the brand ambassador of Vivo mobiles. Vivo is a well-admired brand for its amazing selfie camera mobile phones. Well, we hope Aamir actually sticks to and fulfils all his resolutions. Once known as the world’s richest man, Bill Gates is an American business magnate, founder of Microsoft Corporation, humanitarian, author, investor and philanthropist. He is widely recognized for his dedication to Microsoft. A lot of people look up to him as a source of inspiration and motivation. 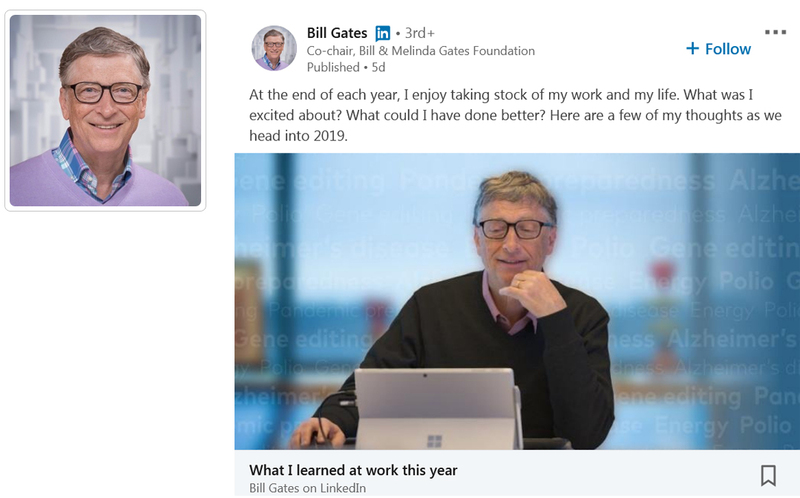 Instead of a regular New Year post, Mr Gates took stock of his work and life during 2018. On his LinkedIn post, he concludes 2018 with everything that made him excited and things that he could have done better during the year. In this post, he talks about how technology can make an impact on our lives. Additionally, Mr Gates also talks about innovation in the fields of education and health. He concludes the post by wishing everyone a ‘happy and healthy start to 2019’. 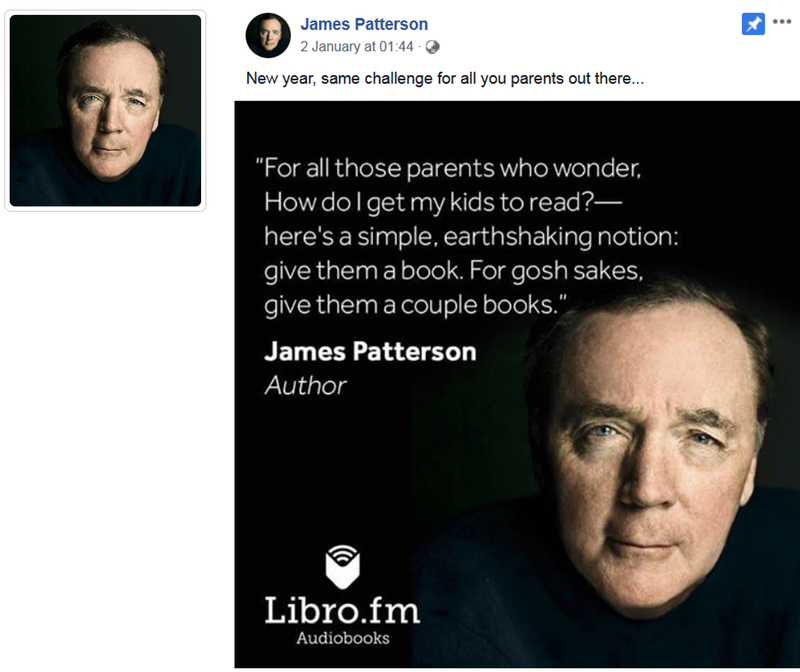 If you are an avid reader, then you must have definitely heard of the famous author James Patterson. He is known for his thriller and non-fiction novels. He is one of the most leading authors in the 21st century. Some of his pretty famous books include the likes of Alex Cross, Women’s Murder Club, Witch and Wizard and lots more. 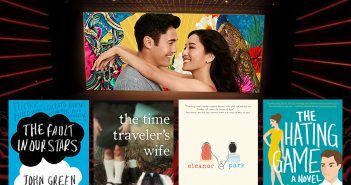 As a writer, his New Year 2019 wish included a reading challenge. His Facebook post is a challenge to all the parents out there to instil reading habits in their children. In all honesty, James Patterson books are very engrossing and addictive. So, it is a challenge that I think we all should take up. Sachin Tendulkar also popularly known as the God of Cricket also sent out New Year 2019 wishes to his fans and admirers across the globe. The former Indian captain shared his wishes on Twitter. The post includes pictures of the cricketer standing on a golf ground, which is no less than a treat for his fan following. In his post, he pursues his fans – young or old to stay fit and in shape mentally and physically. Furthermore, another titbit for Sachin fans is his heart-touching post on Christmas Eve. The cricketer dressed up as Santa Clause and spent his time with the kids at Ashray Childcare home. Indra Nooyi is an inspiration for all the budding female entrepreneurs and leaders. She is an Indian-American business executive and is currently the Chairman at PepsiCo. She penned down a moving and inspiring wish for the New Year 2019 on her LinkedIn profile. 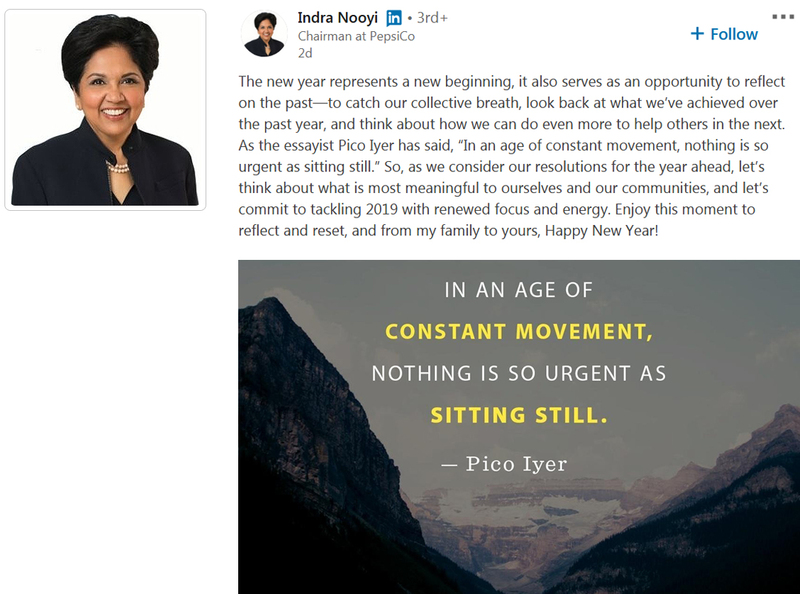 Her post says, “The new year represents a new beginning, it also serves as an opportunity to reflect on the past—to catch our collective breath, look back at what we’ve achieved over the past year, and think about how we can do even more to help others in the next.” Interestingly, Indra Nooyi was also PepsiCo’s first female CEO. The CEO of Apple wished everyone a New Year through his Twitter profile. 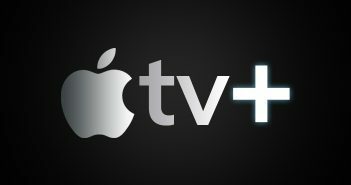 Apple is a leading name in the tech industry and everyone recognizes Tim Cook as the face of the company. Apple iPhones and iPads have become the most fashionable and trending devices to own in our current day and age. Mr Cook wished everyone a happy new year and also quoted ‘Nelson Mandela’ in his post. Looks like Tim Cook also gets his inspiration from legendary leaders. 2018 was a roller coaster ride for the founder of Facebook (with all the things summing up to the Facebook – Cambridge breach in data). He was held accountable when it was publicized that Cambridge Analytica had harvested the personal data of millions of people’s Facebook profiles. Fighting through all this, Zuckerberg still stands strong today. In his long New Year Facebook post, he has spoken about how Facebook started and where it stands today. He also penned down the various changes they had to make to ensure that Facebook was a safe platform for all its users. Starting with a clean slate – a pretty good way of starting the year, right? 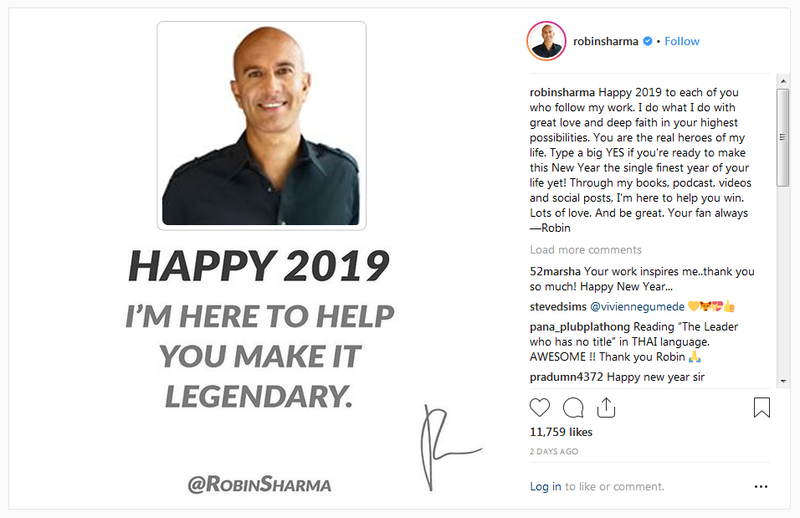 Widely admired for his books like – The Monk Who Sold His Ferrari, Secret Letters and Who Will Cry When I Die, Robin Sharma is another writer on our list who wished his fans a New Year 2019 through his Twitter and Instagram profiles. Robin Sharma books are a great stress buster for everyone who enjoys a good read. In his Instagram post, he thanks all his readers for following his work and urges them to continue doing so in 2019 as well. The author also calls his fans the ‘real heroes’ of his life. Thank you, Robin Sharma, for appreciating your readers.